Once again, it was a day the music died. The red-hot blues of Stevie Ray Vaughan were silenced on a foggy hillside in Wisconsin early Monday when a helicopter crash killed the Grammy-winning Texas guitarist. Vaughan, 35, who rose to worldwide fame in the 1980s while slinging his guitar in Austin clubs, had just completed an outdoor performance with guitar greats Eric Clapton, Robert Cray, Buddy Guy and Jimmie Vaughan, his older brother. When Vaughan was offered the only available seat on a Chicago-bound chartered helicopter leaving the Alpine Valley resort at 1:30 a.m., he accepted, according to his publicist. 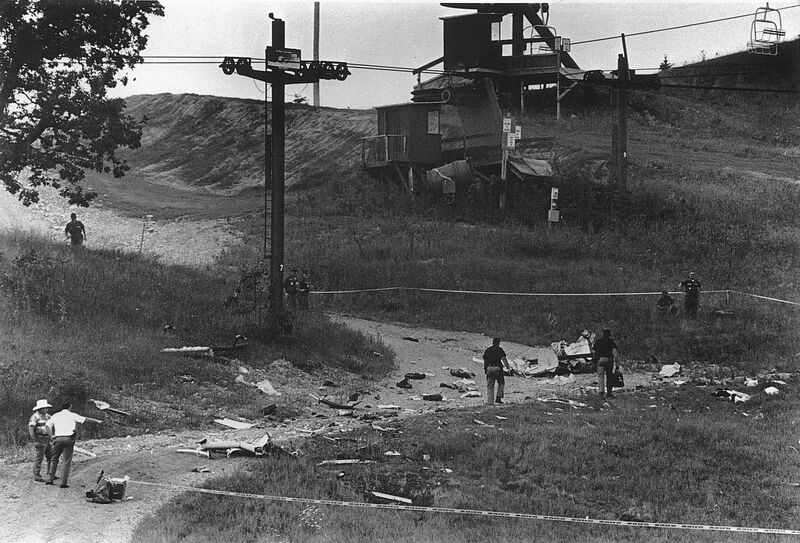 Shortly after takeoff, the five-seat Bell Jet Ranger helicopter slammed into a fog-shrouded ski slope several hundred yards behind the open-air stage, authorities said. The passengers were thrown about 200 feet from the wreckage and were killed instantly. There was no fire, authorities said. The crash, which occurred in southeastern Wisconsin about 70 miles north of Chicago and 45 miles southwest of Milwaukee, also killed the pilot and three members of Clapton’s entourage – a manager, an agent and a bodyguard – authorities said. The Austin-based members of Vaughan’s band, Double Trouble, and Jimmie Vaughan, founder of the equally renowned group the Fabulous Thunderbirds, could not be reached for comment. It was not known how they had traveled from the resort to Chicago, where they were staying on Monday. Vaughan’s death inspired Texas radio stations to play nonstop tributes to the guitar wizard who helped push Austin to the forefront of the national music scene. At Zilker Park Monday night, about 3,000 fans gathered to remember Vaughan at a vigil sponsored by KLBJ-FM. Speakers set up by the radio station carried Vaughan’s music to fans who sat with candles in hand and mourned their guitar hero. The loss of Vaughan also saddened the legendary musicians whose true-blue licks had inspired the young high school dropout, who learned to play the guitar at age 7 in his hometown of Dallas and had club gigs by the time he was 13. 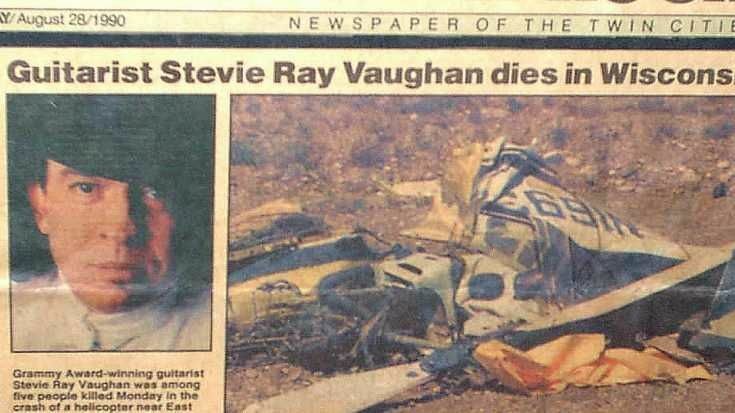 Vaughan joins a list of U.S. musicians who died in air crashes, including Buddy Holly, Ritchie Valens, and the Big Bopper in 1959; Patsy Cline, 1963; Jim Reeves, 1964; Otis Redding, 1967; Jim Croce, 1973 and Ricky Nelson, 1985. The crash “is the worst accident to happen to Texas music since Buddy Holly and the Big Bopper went down in the ’50s. It’s a void no one can fill,” said Casey Monahan, director of the Texas Music Office. “Stevie was perhaps the pre-eminent ambassador of Texas music around the world”, Monahan said. "But, if you met him, he was one of the most humble and almost self-deprecating musicians you’d ever want to meet. “I’m dumbfounded,” said W.C. Clark, who played with Vaughan in Triple Threat, which eventually evolved into Double Trouble. “I felt like a benefactor; I felt like I needed to take care of them,” said Clark, who celebrated his 50th birthday last year with an Austin City Limits show that also featured Vaughan. Vaughan, who lived in Austin from 1972 to 1986 before returning to Dallas, overcame alcohol and cocaine to win two Grammy awards for his hot-rockin’ blues. In 1984, he was awarded a Grammy for best traditional blues recording for the song Texas Flood. This year, he won a Grammy in the contemporary blues category for the album "In Step". He also shared a Grammy in 1985 for his participation in the Blues Explosion compilation album. He sought help for his drinking after falling on a London stage in October 1986. He later told interviewers that his addiction nearly killed him. After his recovery, he’d often introduce a song by dedicating it to those still suffering from addiction. Charity got a healthy portion of Vaughan’s earnings. He was proud to outdo by $1,000 the $9,000 donation Bruce Springsteen made to Austin’s Capital Area Food Bank in 1986. Vaughan mesmerized his loyal, sold-out audiences with a flamboyant playing style that included the theatrics of playing guitar behind his back, over his head and with his teeth. Sometimes it was difficult to tell whether Vaughan made his Fender Stratocaster or the audience scream louder. His quick fingers could make the good times roll faster than lightning. He could be counted on to show up in flashy clothes – capes, colorful suits, beaded vests, and, always, a low-brimmed hat and funky boots. For his last concert, he chose purple pants. The concert at the Wisconsin resort’s Alpine Valley Music Theater before an estimated 25,000 fans ended about 12:15 a.m. with a final encore jam by the five guitarists, who played Sweet Home Chicago. As they played, anyone looking behind the stage could see the four helicopters lined up on the lawn. In addition to Vaughan, killed in the crash was Bobby Brooks, 34, Clapton’s agent at Creative Artists Agency, who also represented Crosby, Stills & Nash, Whoopi Goldberg, Pat Benatar, Jackson Browne and Dolly Parton. Also killed were Nigel Browne, a Clapton bodyguard; Colin Smythe, one of Clapton’s tour managers, and Jeff Brown, the pilot for Omni Flight Helicopters, Inc. of Chicago. After Vaughan’s helicopter went down, “the transmitter, the black box signal, was picked up by the Civil Air Patrol at 2 a.m., and the (Walworth County) sheriff’s office was notified at that time,” said Jim Wincek, marketing director for Lakeland Medical Center in Elkhorn. The wreckage was found about 5 a.m., he said. The bodies were taken to the Lakeland hospital, where autopsies were to be performed, Wincek said. The National Transportation Safety Board dispatched an investigator to the crash site, but the public report on the cause of the crash probably won’t be completed for months, officials said. “It was a high-energy impact at a shallow angle,” said Bill Bruce, the NTSB investigator. Vaughan’s family — his brother and mother, Martha, of Dallas — were unavailable for comment on Monday. Family friends said the arrangements for services and memorials will be announced later. Vaughan was divorced. Members of Double Trouble — bassist Tommy Shannon, drummer Chris “Whipper” Layton and keyboardist Reese Wynans, all of Austin — were unavailable for comment Monday. Vaughan formed the band in 1981 and reached stardom two years later with the group’s first album, "Texas Flood", released in 1983. The band earned a platinum album with "Couldn’t Stand the Weather" in 1984. Guitar Player magazine listed Vaughan as the best electric blues player in 1983, 1984, 1985, 1986 and 1988, and named him to its “Gallery of Greats” last year. Among the songs that earned Vaughan fans around the world are Love Struck Baby, Little Sister, Crossfire and Voodoo Chile, a Jimi Hendrix song that always prompted favorable comparisons with the legendary guitarist. Vaughan often received guitar reinforcement from his older brother. Sometimes they simultaneously played a double-neck guitar, with Jimmie standing behind his little brother and stretching his arms around him in a sort of backward bear hug. Jimmie recently left the Fabulous Thunderbirds. Epic Records is scheduled to release a joint record by the two brothers next month, and they had talked of touring together.